Steven Gerrard has issued his starkest warning yet to Croatian left back Borna Barisic that his Rangers career is starting to skate on thin ice. The 26-year old, fully fit as confirmed by Gerrard, was completely left out of last night’s match day squad for the trip to Rugby Park after the fiasco of his ‘injury’ then recovery after the HJK match about which Stevie was clearly extremely unamused. The ex-Osijek man’s time in Glasgow has been completely disastrous so far, with constant injuries curtailing any sense of a run in the team or consistent performances, and after Gerrard confirmed there was ‘nothing wrong with him’ he dramatically gave him a bit of a warning by completely axing him from the squad to face Steve Clarke’s men. Some fans have made a tenuous claim that it was related to the plastic pitch, and that’s why he was left out. 1: The whole point of having a player and wanting to toughen him up a bit is to put him on the more difficult surfaces – if he’s ‘protecting’ the player then that flies in the face of his frustration over his depressingly low pain threshold. 2: And is a contradiction after Niko Katic announced he hated plastic pitches and they hurt his back due to his height – Gerrard then selected him for the Livi match, on a 3G pitch. 3: And doesn’t account for his selecting the in-from-the-cold Jordan Rossiter, out for borderline two years with a plethora of injury issues who started that same match as Katic at the Tony Macaroni on its artificial surface. 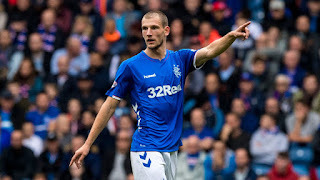 So, no, this was a warning to Barisic – shape up, ‘grow a pair’ and get with the program at Ibrox or he may find himself looking for a new club this summer. And that would be a shame because the lad clearly can play a bit. When he’s fit, that is. Must agree totally and more. Way before we signed Borna my son looked him up. Katic IS OUR BEST in that position. I DO NOT like Steve Davis as if he were Rangers class hd wouldn't have been gamesless so long. Give me McCrorrie or DEFINITELY better than Davis. Whats all the problems of playing Fast Skillful Difficult to control Yojng Players? Can equally be applied to the management team. This is entirely reading between the lines IN. I'm not aware that Gerrard has publicly, or otherwise, criticised Barasic for any injury. Robrob57 may be right but i'm getting totally skunnered, with the amount of crocks, out on injury this season. Might as well use £10 pound notes, as cigarette papers and smoke them. How come Celtic manages to go a full season, with a fraction of the injuries, we have? What's the story with that?